Economic growth performance in the Asia-Pacific region continues to improve on the back of firmer global demand and stable inflation. The tasks at hand are to ensure that such economic performance is sustained over time, that it benefits everyone and that any adverse environmental implications are minimal. Financial risks and protectionist trade measures weigh on the near-term macroeconomic outlook, while medium-term challenges, such as lifting the region’s potential for economic growth and reducing poverty on a sustained basis, persist. Furthermore, while rapid technological advancements present immense opportunities, they can also pose considerable challenges in terms of job polarization and income and wealth inequalities. China’s pursuit of innovative, inclusive and sustainable economic growth could also have important regional impacts through trade, investment and other channels. The implementation of the necessary policy initiatives will require not only the channelling of existing financial resources of both the public and private sectors towards sustainable development, but also the mobilization of additional financial resources. 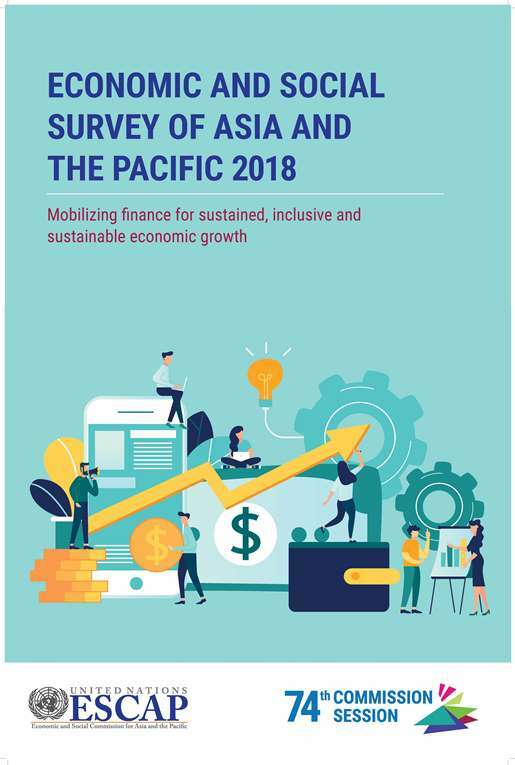 The Economic and Social Survey of Asia and the Pacific 2018 contains an examination of how Governments of countries in the Asia-Pacific region could increase domestic public financial resources and leverage private capital to strengthen their long-term economic prospects. It contains estimates on how much additional finance countries may mobilize from such measures as reforms in tax administration or tax incentives, introduction of carbon taxes, prudent sovereign borrowing from financial markets and creation of an enabling environment for public-private partnerships. The first chapter of the Survey for 2018 provides a macroeconomic assessment of the Asia-Pacific region and its subregions, with a discussion of risks to the economic outlook. Moreover, it highlights medium-term challenges associated with productivity growth and decent jobs. In the light of such risks and challenges, the chapter lays out policy considerations in the areas of monetary and financial policy, fiscal policy, structural reforms with a focus on fostering inclusive innovation, and other measures to achieve sustained, inclusive and sustainable economic growth. A special section on China’s economic transformation highlights both the challenges of improving the quality of growth and managing potential regional spillover effects. The second chapter examines how Asia-Pacific economies could increase domestic public financial resources and leverage private finance to support sustained, inclusive and sustainable economic growth. On strengthening public finance, the chapter estimates the revenue impact of better tax administration and policies aimed at broadening the tax base, particularly the introduction of carbon taxes and the rationalization of tax incentives for foreign direct investment. The chapter also considers how to enhance the role of prudent sovereign borrowing from financial markets in supporting the fiscal space. On leveraging private capital, the chapter studies how an enabling policy environment could help catalyze investment in infrastructure projects, especially under public-private partnerships, and how financial intermediation could be deepened through widening the investor base and diversifying financial instruments. Overall, the chapter suggests that the prospect for mobilizing development finance is promising. The success of these resource mobilization strategies is conditional on careful implementations and closer regional cooperation. The goal of chapter 3 is to delve into certain aspects of financing for development issues from a subregional perspective, and to share knowledge and lessons learned regarding dealing with challenges that are specific to certain subregions. The underlying premise of this chapter is that, for countries to be able to make the investments required towards implementing the 2030 Agenda, a necessary condition is that sufficient financial resources be made available. Depending on the actor that is taken as a reference (public or private sector), this basic premise has different implications. For the public sector, it means that public authorities should be able to mobilize a significant, stable flow of financial resources. For the private sector, this means that firms should have access to credit or equity to undertake investments. Both perspectives are comprised in the analyses comprised in this chapter. No. 62, April 2018: “What explains divergent investment performances in Asia-Pacific?”. No. 63, May 2018: “Technology progress: Carpe Potestatem - Seize the opportunities for the region”. No. 64, April 2018: “Securing financial stability through macroprudential measures”. No. 65, April 2018: “Making effective use of fiscal space for sustainable development”. No. 66, April 2018: “Universal basic income”. No. 67, April 2018: “Leveraging technology in fiscal management”. No. 68, April 2018: “Improving tax administration”. No. 69, April 2018: “Expanding the tax base”. No. 70, April 2018: “Prudent sovereign borrowing from financial markets”. No. 71, April 2018: “Leveraging private finance for sustainable development”. No. 72, April 2018: “Enhancing the policy environment for public-private partnerships”. No. 73, April 2018: “Potential of financial technology in East and North-East Asia”. No. 74, April 2018: “Developing local currency bond markets in South-East Asia”. No. 75, April 2018: “Managing fiscal volatility in the Pacific”. No. 76, April 2018: “Reforming tax systems in South and South-West Asia”. No. 77, April 2018: “Access of micro-, small and medium-sized enterprises (MSMEs) to finance in North and Central Asia”.